"Let's just say that I want to believe." * We went to see The X-Files: I Want to Believe yesterday. It is not a flawless film by any means, but on the whole I was quite satisfied with how it treated the series' characters and themes. I enjoyed it far better than the first X-Files film, and I definitely recommend it, especially to fans of The X-Files. * I've discovered a terrific new podcast that focuses on science fiction short stories from “SF’s Golden and Silver Ages.” Each show covers a story that was originally published between 1927 and 1965, and includes a dramatic reading (abridged or unabridged, depending on its length) and discussion and commentary about the tale. Thumbs up for A Bite of Stars, A Slug of Time, and Thou. Father Joe: So you believe in these kind of things? Fox Mulder: Let's just say that I want to believe. 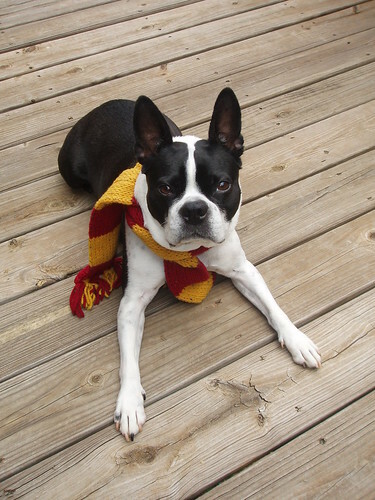 One of my friends has a badge ribbon that she hands out that says "Gryffindog". 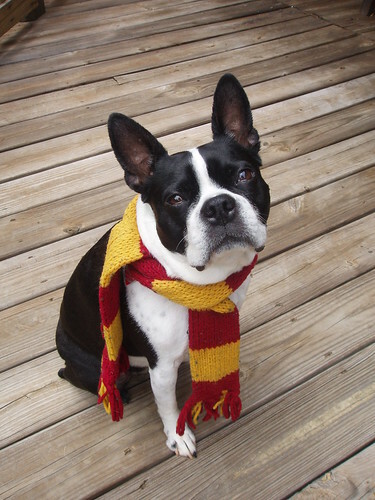 It's in honor of Tully the Wonderdog, her companion animal. 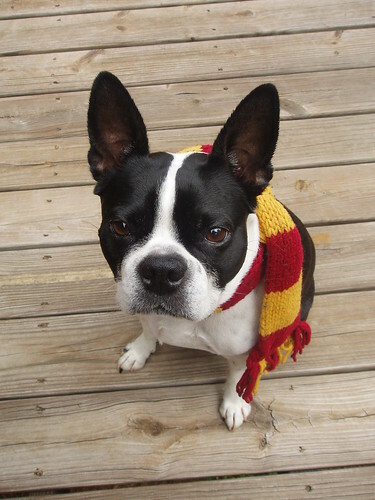 "Gryffindog" - I love it! That's so clever. Virginia definitely identifies with that. You are so thoughtful to think of it. Thank you! Aw, Virginia is very cute! Is that really a song about Scully that you're listening to? hehe Love the pics. :) She is such a camera girl. Too cute! Ah, I am glad to hear your take on the new X-Files is positive. I can't wait to get a chance to see it. I hope you enjoy the movie too It's so lovely to see Mulder and Scully (and others *ahem* but I won't spoil you) after so many years. Hugs and best wishes to you for a great week, Louise! Your reaction to the X-files movie succinctly sums up mine. :-) I'm glad it was made; I'm glad I saw it; I'm going to spend some time analyzing its flaws, but overall I thought it worked well and treated the characters and themes with realism and respect. Great minds think alike! :) I'm so glad you liked it, too. I think I may have to see it again to let it soak in and to enjoy it to its fullest. She thanks you for your snorggles and kind words! She looks very happy to be wearing it. Aw, thank you! Virginia sends puppy kisses your way. Awwwww. That is so sweet - I can picture that 'discussion' quite clearly. Yes, I saw the X-Files movie last night. It was pretty good. I got the impression of a better than average episode and I loved seeing everyone again. Anway, it worked and I was satisfied. That's exactly how I felt about the movie. I'm glad you were satisfied, too! She looks extra courageous! And absolutely darling, of course. Wow. I actually saw a SF-type movie before you. I'm happy you liked it. I thought it was like a warm hug that doesn't feel exactly right but you still don't want it to end. It crosses that 2 to 3 second platonic hug limit but without any squick. LOL! That's a terrific description. I was heartened when I read your review, and I definitely agree. We were a bit shocked the other day to find that Chloe's muzzle was greying - she's only 5 years young! Jealous re the X-Files movie - so want to see it and pretty sure we'll have to wait till it's out on dvd before we'll have the pleasure. Good to hear that it's better than the first movie; I wasn't too thrilled with that one!